Here we continue to investigate the phylogenetic relationships of taxa ascribed to the primarily lichen-forming families Trypetheliaceae, Monoblastiaceae and Arthopyreniaceae. We demonstrate that the genera Julella and Arthopyrenia do not form monophyletic groups with taxa from these genera instead being placed both in Pleosporales and Trypetheliales. Within Dothideomycetes, lichen-forming species with brown ascospores are generally placed in the genera Mycomicrothelia, Architrypethelium, and Aptrootia in the family Trypetheliaceae. We tested the taxonomic placement of Anisomeridium phaeospermum, in Monoblastiaceae. This species produces brown-spores with wall ornamentation and therefore appears morphologically similar to Mycomicrothelia. Despite these morphological similarities, molecular data confirmed its placement in Anisomeridium. Consequently, the distinction between these two genera is in need of clarification and ascus characters are identified as the principal discriminating feature. 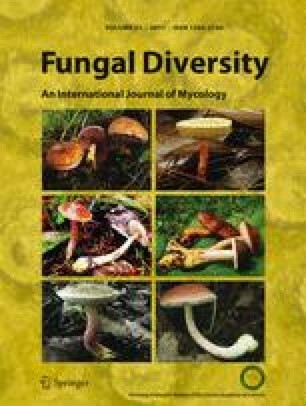 Finally, we identify the non-lichenized taxa Heleiosa barbatula and Funbolia dimorpha as being part of the otherwise lichen-forming family Monoblastiaceae. This is confirmed by the perithecial anatomy of the sexually reproducing Heleiosa barbatula. The online version of this article (doi: 10.1007/s13225-011-0144-7) contains supplementary material, which is available to authorized users. We are grateful to a number of organizations for funding including: NSF-DEB 0715660 “Neotropical Epiphytic Microlichens—An Innovative Inventory of a Highly Diverse yet Little Known Group of Symbiotic Organisms” to The Field Museum (PI Robert Lücking), NSF-DEB 0717476 “Systematics of Dothideomycetes to The Field Museum (coPI Thorsten Lumbsch; PI: J. Spatafora), a Cirrus grant to DePaul University supported Joelle Mbatchou, a grant from the Committee on Evolutionary Biology, University of Chicago to Matthew Nelsen, and the Caterpillar® company provided funds to study lichens from Panama. E. Rivas Plata and Z. Palice are thanked for use of collections. K. Hyde and C. Schoch are thanked for the invitation to contribute this manuscript, and K. Hyde is thanked for comments that improved the manuscript. R. Harris and A. Aptroot are thanked for discussions providing insight into the taxonomy of Anisomeridium and Mycomicrothelia. Most DNA analyses were performed at the Pritzker Laboratory for Molecular Systematics and Evolution at the Field Museum.